G.I. 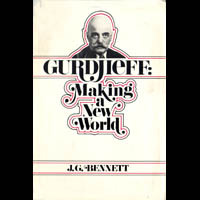 Gurdjieff was one of the most significant spiritual teachers of the 20th century and his teachings have had a major influence on Western thinking. P.D. 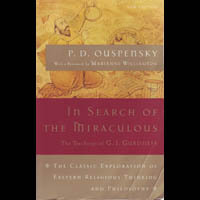 Ouspensky is Gurdjieff's most famous pupil and this fascinating account of his years of study with Gurdjieff in Russia and elsewhere is generally considered the most accessible introduction to Gurdjieff's system of ideas. Highly recommended. 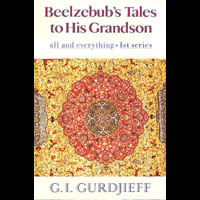 Beelzebub's Tales is considered Gurdjieff's magnum opus and contains, in allegorical form, the essence of his teachings. The complex writing style employs numerous invented words ('heptaparaparshinokh') which demand a sustained attention on the part of the reader to unravel the substance and meaning of the narrative. This series of five lectures is an introduction to and distillation of Gurdjieff's basic psychological ideas. The style of writing is provocative, designed to challenge the reader's preconceptions and beliefs. 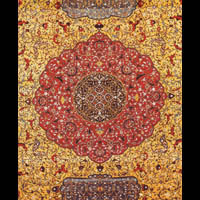 The book is a compendium of the sayings and teachings of Gurdjieff as well as a rich description of life at Gurdjieff's Institute in France during the 1920s and 1930s. 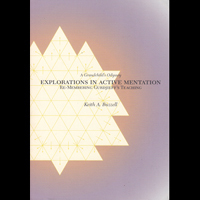 Nott writes clearly and insightfully and captures the nature of practical work in an esoteric school. 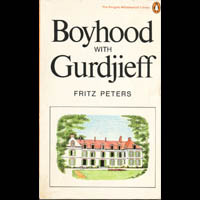 Fritz Peters first met Gurdjieff at his Institute in France when he was only 11 years old. The book is charming, innocent and humorous, providing many insights into the way Gurdjieff imparted his teachings to both children and adults. 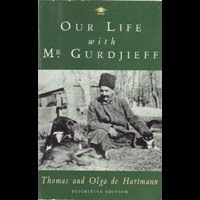 Thomas de Hartmann collaborated with Gurdjieff in composing and arranging much of his music, while Olga de Hartmann served as Gurdjieff's personal secretary for many years. This poignant account of their years with Gurdjieff provides an honest and revealing description of inner work under the guidance of a master. 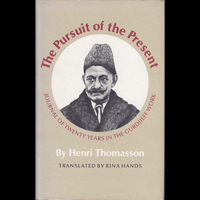 This important volume consists of talks, lectures and conversations with Gurdjieff as recollected by his pupils between 1917 and 1930. The book provides an authentic glimpse into the way Gurdjieff presented his ideas and challenged his students. John Bennett was one of Gurdjieff's best known students. The book weaves together the story of Gurdjieff's search for esoteric knowledge and the ideas and methods transmitted by Gurdjieff during his teaching mission. Nicoll studied with Gurdjieff and Ouspensky and led study groups in England for many years. 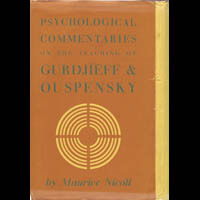 The five-volume Commentaries is a detailed and precise description of Gurdjieff's psychological and cosmological ideas. 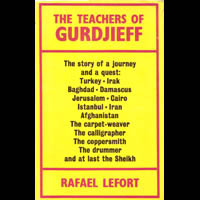 The third series of Gurdjieff's writings is a fragmentary draft of what he intended to write and was not originally meant for publication. It reveals many of his innermost thoughts and feelings and autobiographical details drawn from his extensive search for esoteric knowledge. Based on journal notes, this very personal memoir describes Thomasson’s inner and outer failings as he diligently practices the Work. He provides important material on the quality of inner attention, the nature of group work and the experiential efficacy of the Movements as instruments of self-understanding and spiritual transformation. Jacob Needleman & George Baker, eds. 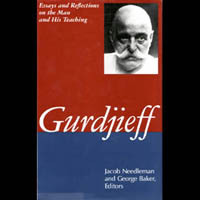 This impressive volume is an anthology of essays, interviews and personal accounts of Gurdjieff and the impact of his teaching. 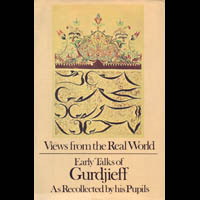 The personal reminiscences by pupils who worked directly with Gurdjieff are the most moving and valuable contributions. Dr. 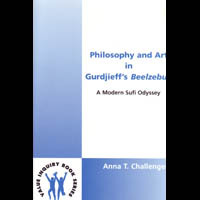 Challenger's scholarly work examines the alleged Sufi sources of Gurdjieff's teaching, expounds his theory of art and interprets selected stories from Beelzebub's Tales. The author's approach is creative and refreshing. 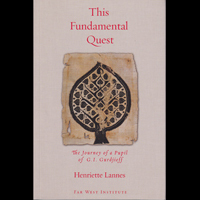 Henriette Lannes was a student of Gurdjieff during the 1940s in Paris and later led Work groups in France and England. The book is a compilation of various notes, talks and exchanges, and offers a perceptive exploration of practical self-study and work on oneself. 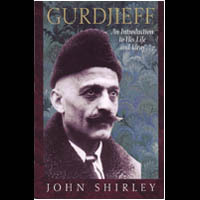 John Shirley provides an accessible introduction to Gurdjieff's life and discusses his ideas and unique teaching methods with clarity and considerable objectivity. John Pentland was president of the Gurdjieff Foundation for many years and was regarded as an important teacher of the 'Work.' 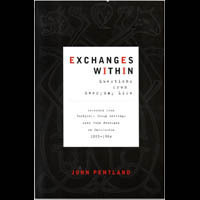 Exchanges Within records the questions of hundreds of students of the Fourth Way and Pentland's very precise and insightful responses. Patty de Llosa met Gurdjieff when she was a child and has been a student of the Work for more than 40 years. 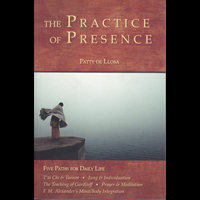 In this book she explores the practice of presence and mindfulness from the perspective of “five paths of daily life,” including the teachings of Gurdjieff. The connecting thread of each tradition is the importance of conscious awareness grounded in the present moment, and balanced harmonious development of body, mind and feelings in everyday life. Dr. Buzzell explains Gurdjieff’s psychological and cosmological teachings from the perspective of modern scientific concepts and principles. The book is replete with high quality diagrams and figures which illuminate the challenging ideas presented and reveal the underlying unity of Gurdjieff’s vast system of knowledge. Dr. Buzzell is scientifically trained and attempts to elucidate “resonant aspects of modern science and the Gurdjieff teaching.” Drawing on an impressive knowledge of contemporary brain research he artfully integrates scientific concepts into the framework of Gurdjieff’s teachings on balanced human development. This excellent anthology is a collection of material published in Parabola magazine over the last thirty years. 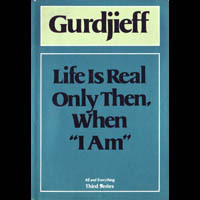 The authors, most of whom were direct students of Gurdjieff, present the fundamental ideas and practices of the Work from a variety of perspectives. During World War II Gurdjieff quietly taught small groups of students in Paris. Transcripts of these wartime meetings form the content of the book. We hear Gurdjieff speaking in his own voice as he guides and challenges his students in the practice of the Work. 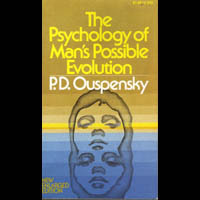 The author studied with Ouspensky and Gurdjieff and led study groups in Washington, D.C. for more than 30 years. 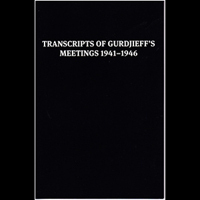 The book is based on recordings of group meetings during this period and is an excellent presentation of Gurdjieff’s essential teachings. 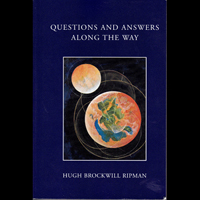 Ripman’s humanity and common sense, as well as the depth of his understanding, is evident throughout the book. 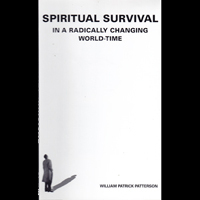 Patterson explores the challenges, dangers and opportunities of our modern technological society and how it can spur us to awaken to a new integration of body, senses and mind. 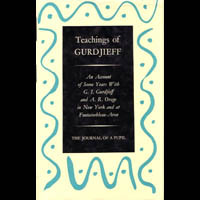 The book consists of transcripts of Fourth Way meetings, essays and directed talks on various aspects of Gurdjieff’s teachings. Based on notebooks kept by Jeanne de Salzmann, Gurdjieff’s closest follower, the book offers new insights on his Fourth Way spiritual teaching. It is a uniquely authoritative guide to his ideas and methods for liberating ourselves from the state of “waking sleep” in which most of us live our lives. 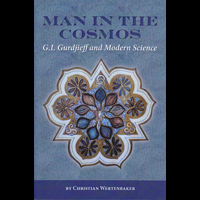 Dr. Wertenbaker, a long-time member of the Gurdjieff Foundation, explores the relationship between the mystical cosmology of Gurdjieff and the discoveries and theories of modern science. 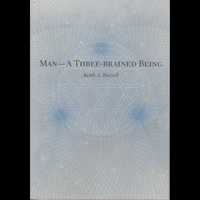 Through a series of essays, he provides a fresh look at the relationship between the inner world of consciousness and the outer world of phenomena. 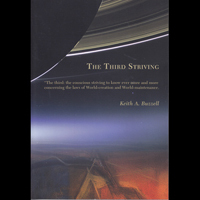 The title of the book is an allusion to the third of Gurdjieff’s five ‘essence strivings’: "to know ever more and more concerning the laws of World-creation and World-maintenance." 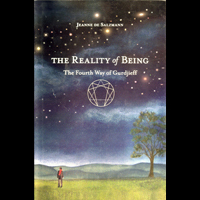 Dr. Buzzell blends Gurdjieff’s ancient Fourth Way teachings of inner transformation and harmonious development with findings from many modern scientific disciplines, ranging from biology to astronomy. 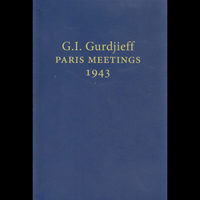 The book is an English translation of notes taken at meetings between Gurdjieff and groups of French pupils in 1943 at his Paris apartment. The exchanges chronicle Gurdjieff’s practical style of oral teaching and reveal, in his interactions with pupils, his immense patience, humour, encouragement, humanity, and compassion. Recurring themes include overcoming inertia and automatism, unifying the physical, emotional and intellectual centers, experiencing the organic nature of ‘I Am,’ and awakening conscience through the practice of remorse.